Each machine and part is dispatched from company where it is adjusted and tested properly by highly trained engineers to give you the utmost satisfaction and reliability. With the highly efficient team of professionals and skilled labour, Ginza takes care of the minutest detail which carries its name. Ginza is aware about the fact that the quality of your work spreads your name which can be achieved only by hard work, devotion and innovation. With state-of-the-art infrastructure, ARM STITCH boasts of high-end quality standards, undeterred dedication and precision which rules over every step and process carried out at Ginza. 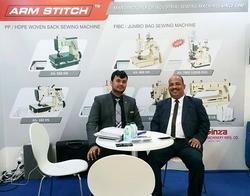 The team at Arm Stitch works with passion and perseverance and respects the idea of working as a team with the continuous urge to excel and attain perfection. We are a client centric organization and attempt hard to provide our clients optimum satisfaction. Assisted by a team of experienced professionals, we make certain that these products are manufactured in compliance with the international quality standards using optimum grade raw material and advanced technology. Our professionals work in close co-ordination with our valuable clients to know their specific requirements. Further, our ethical business policies, transparent dealings, client centric policies, competitive price structure and timely delivery approach enable us to attain optimum satisfaction of our clients. Plot No. 1106/07, Phase 3, D Road, G. I. D. C.